There’s a new top Dawg at the University of Georgia. Jere Morehead was officially installed as the 22nd president of the university on July 1, replacing former president Michael Adams. But Morehead is hardly an unknown quantity. 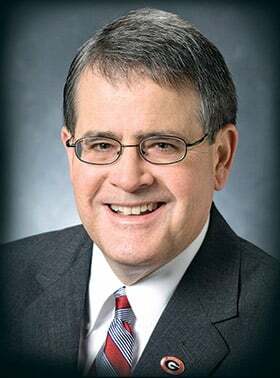 He served as senior vice president for academic affairs and provost for the past three years and, except for one year as a visiting professor at the University of Michigan, spent the majority of his academic career at the flagship university. Interestingly, the academic world wasn’t More-head’s first career choice. As a teenager he was captivated by the Watergate hearings on television. “I wanted to be a federal prosecutor,” he recalls. “I thought it would be a great calling in life.” He graduated early from high school, at 16, got his undergraduate degree from Georgia State Univer-sity and headed to UGA for law school when he was 20. Morehead made himself develop a more animated style in the classroom: walking up and down the classroom aisles, calling out students in the back and asking lots of questions. He be-lieves it helped him as a teacher, and his résumé bears that out. Through the years, Morehead received numerous teaching awards, including the Josiah Meigs Award for Excellence in Teaching in 2001. After chairing the Task Force on the Quality of the Undergraduate Experience in 1996, Morehead became interested in administration. “That was probably the first time I began thinking about the fact that the best way to impact what you care about is to step forward and serve,” he says. His first administrative position was serving as associate provost and director of the Honors Program in 1999. In one of his first an-nouncements as president-elect, Morehead said the uni-versity would take a greater role in promoting economic development statewide by opening an economic development office in Atlanta. Morehead is committed to raising the academic stature and reputation of UGA, something that won’t be achieved by words and “woofs” alone. During the upcoming capital campaign, Morehead plans to look for those “trans-formational gifts” that provide significant, long-term impact for the university by focusing attention and re-sources on specific programs.